Refashion Co-op: That's never going to work! That's never going to work! For my second attempt at a jeans refashion for Portia's challenge - the refashioners2016 , I grabbed 2 pairs from my $1 a pair Goodwill haul. One pair were medium weight, with a little stretch. I really liked the other pair (Banana Republic) - lighter weight, with a texture that almost looked like a faint tartan to a pair of old eyes. They were wide leg, so even though they were smaller than I wear, the extra fabric seemed to offer up more possibilities. I don't know quite what I was thinking, but I started pondering KILTS.....a totally inappropriate garment to make out of a limited amount of fabric that's already cut into shapes and stitched together!! OK, back on planet earth.... unless I drop about 10 sizes overnight, I"d never be able to cut a kilt out of 2 pairs of jeans. So, my skirt kind of evolved - I cut front and back panels from the heavier jeans, using the outside leg seams as my CF and CB. I saved the zip and sewed it into the back seam. I then cut 4 hip panels, shaping by eye and adjusting on my body. I thought the wide leg jeans would give me a decent amount for side pleated sections, but found they had a sneaky bias seam. I used them anyway, even though those seams caused some bulk and twisting. 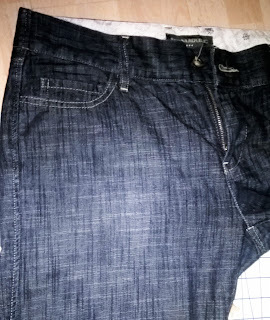 I unpicked the the two back pockets, stitched them together, and added them to one side. I cut fabric from the deep hem allowance to make straps for the other side, and added a couple of rings from my stash. Well, it's not exactly a kilt, but it's definitely more useful than 2 pairs of jeans not in my size!! The finished skirt is a little twisted and stretched in places but wearable, and will definitely get a lot of use - certainly worth the whopping $2 outlay! Well it looks like a pretty good kilt lookalike to me. What a fun idea to make a kilt. It looks great.